How to make a phone call using intent in Android? I'm using the following code to make a call in Android but it is giving me security exception please help. You can use Intent.ACTION_DIAL instead of Intent.ACTION_CALL. This shows the dialer with the number already entered, but allows the user to decide whether to actually make the call or not. ACTION_DIAL does not require the CALL_PHONE permission. and now every thing is working fine. Use the action ACTION_DIAL in your intent, this way you won't need any permission. The reason you need the permission with ACTION_CALL is to make a phone call without any action from the user. If you use Intent.ACTION_CALL you must add CALL_PHONE permission. Its okey only if you don't want your app to show up in google play for tablets that doesn't take SIM card or doesn't have GSM. So if it is not critical feature to your app, try to stay away from adding CALL_PHONE permission. No permission needed for this. For making a call activity using intents, you should request the proper permissions. For that you include uses permissions in AndroidManifest.xml file. 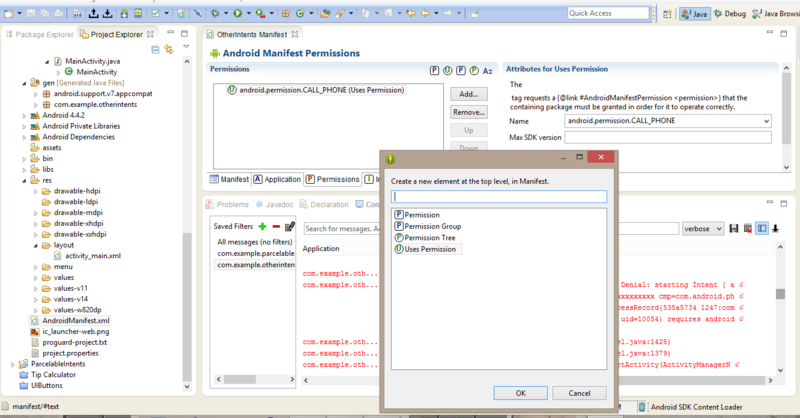 In Android for certain functionalities you need to add the permission to the Manifest file. 6.Save the manifest file and then run your project. Your project now should run as expected. Not the answer you're looking for? Browse other questions tagged android android-intent phone-call android-implicit-intent android-phone-call or ask your own question. Optional permissions so an app can show on all devices and enable optional features on some?